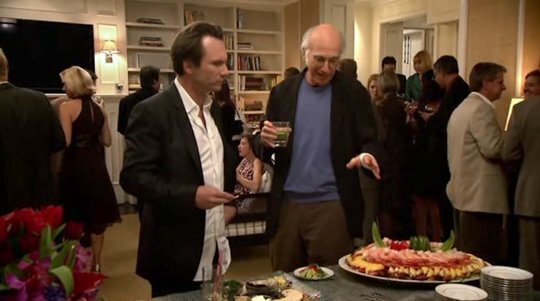 With season nine of Curb Your Enthusiasm being announced today, TBS is celebrating by wasting the work day and watching Larry David clips instead. Here are our top five! It is tough sometimes deciding what to take to a dinner party. In this clip, Larry decides to be “different” by bringing a bread stick instead of wine, only to be told off by the host, then upstaged by Ricky Gervais. One of the best scenes from Curb Your Enthusiasm, ever, saw Larry buying a sowing machine for the flamboyant and fabulous son of a woman he is dating, only to see the mother get irritated that Larry is trying to “turn him gay”. Never happy. Ugh, people are annoying. No one is more annoying than a sample abuser. The person in front of you in the line who has to sample all the food before making a decision. Again, dinner parties. Larry is dreadful at them. Calling Christian Slater a caviar whore and then schooling him on “allotment” laws in society…? Larry eventually ends up staying in the same building as Michael J Fox, and becomes fixated with the idea that he is purposefully making noise to irritate him. Larry ends up confronting Michael who claims it is all part of his Parkinson’s condition. Bring on season nine. Welcome back, Larry!